LaDonna Redmond is the Diversity and Community Engagement Manager for the Seward Co-op. LaDonna leads the co-ops diversity and engagement initiatives that contributes positively to organizational culture, marketplace competitiveness, and social responsibility. LaDonna is a community activist who worked on several public health issues throughout her career such as substance abuse, violence and food justice. 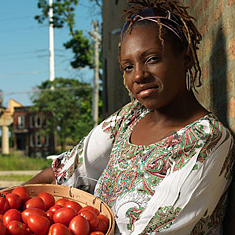 LaDonna successfully worked to get Chicago Public Schools to eliminate junk food, launched urban agriculture projects, started a community grocery store and worked on federal farm policies to expand access to healthy food in communities of color. LaDonna is a 2003, WK Kellogg Food and Society Policy Fellow In 2009, Redmond was one of 25 citizen and business leaders named a Responsibility Pioneer by Time Magazine. LaDonna has a popular Tedx talk, Food + Justice = Democracy.